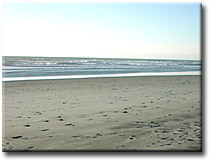 Locales and beaches are listed by location from North to South. All pictures are authentic photos of their respective beaches. 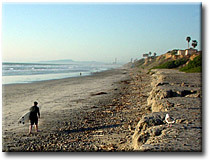 Carlsbad State Beach (aka Tamarack Beach), with its four mile beach and jogging trails (one high on the bluffs and another and down at the beach), is popular for day use and BBQs. It offers swimming, surfing, scuba diving, fishing and beachcombing. It's also close Carlsbad Village (the downtown area) on the top of the bluffs where you can grab something to eat. The beach is at the foot of Tamarack Avenue. South Carlsbad State Beach offers camping on bluffs overlooking the beach and ocean. Reserve early - the campground is usually full (and crowded) on weekends and in summer. There are no day use facilities in the campground and it's more isolated than Tamarack Beach. Anyone can use the beach for the day. It offers swimming, surfing, skin diving, fishing and picnicking. For campground reservations, call 800-444-PARK or see the State Parks web page. Online reservations can be made here. Campers under the age of 18 must be accompanied by a parent, or provide upon arrival a letter from a parent granting permission to camp. All juveniles must be in their own campsite after 10 PM. Quiet hours are 10 PM - 6 AM. Visitors not staying overnight must be out by 10 PM. Campsite is limited to 8 people maximum and is designed for individual family use. Large groups require a special event permit. Take precautions to prevent theft by securing property. Camping fees are $14 to $16 per night. The camping fee includes entry for 1 vehicle and one legally towed vehicle or trailer. The park staff will collect any extra vehicle fees upon entry. Campsite is limited to 3 vehicles, including a trailer. There is no parking in the area for more vehicles. Dogs must be on a leash less than 6 feet at all times, and are prohibited on the beach and outside at night. Maximum stay during High Season (June - September) is seven nights. All persons and equipment must vacate for a minimum of 48 hours before beginning another stay. © 2003 Global Domains International. All rights reserved.